The Tell-Time Shirt | OhGizmo! 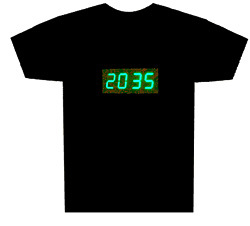 Coming only in black the Digital Clock T-Shirt has an electro-luminescent panel on the front that displays the current time in glowing green numbers. And if the static display doesn’t fit your style you can select up to 8 different flashing patterns or even switch it to a stopwatch mode. The shirt is powered by 4 AA AAA batteries which reside in a small, discreet pocket inside the shirt and will last between 12-36 hours depending on the flashing mode selected. And not surprisingly the shirt is hand-wash only. The Digital Clock T-Shirt is available from LatestBuy.com.au for $59.95. Excuse me. Could you tell me what time is it now ?